Then keep refreshing for the instance id to get the public dns name, or Ip, and then ping to know when the interface is up, then keep trying to access via ssh. That’s specifying your script, that will be executed when the instance starts. This is done in Amazon through the User data. There you can provide your scripts in plain text, in base64, or add as a file and they are executed as root. In our case I created my scripts to automate tests and save time, while being more accurate. echo "Using logfile $file_route.log Server up: $date_server_up Unix Time: $date_server_up_unix_time"
echo "Starting cmips dd tests at $date_start_dd Unix time: $date_start_dd_unix_time"
echo "Ending cmips dd tests at $date_end Unix time: $date_end_dd_unix_time Total seconds dd with sync: $total_seconds"
In /var/log you can find the cloud-init.log file and examine it in deep if you’re curious. 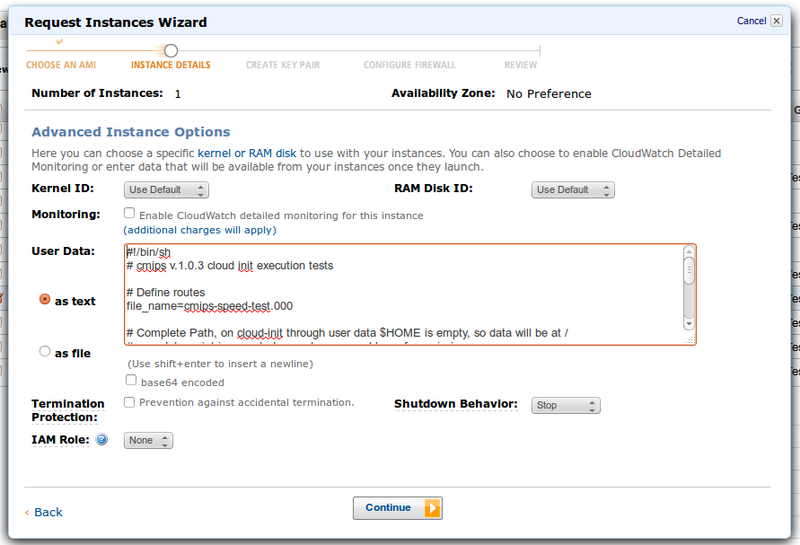 This entry was posted in Cloud scripts, General CMIPS info and tagged Amazon EC2, Cloud Init, User data on 2013-09-24 by admin.